Airplanes, Cheap Gas, Grass Strips, Mountain Flying, Fishing, Cabins, and Fish Fry's. You couldn't put another adjective or verb into a statement and have it be any more perfect! So lets do it! Simple Flight is proud to present a Fly-In Adventure to Gastons Airport (3M0) in Lakeview, Arkansas SEPTEMBER 15 &16 2012. It's almost like we will be flying an old legendary route for Ozark Airlines. Chicago to Lakeview Arkansas with a connecting stop in St. Louis. This trip is orchestrated to "kill many birds with one stone." You will get approximately 4-6 hours of flight time, a Flight Review, a new airport in your log book, and many more stories to pass through generations. We don't need an excuse to go flying, we just need an adventure. 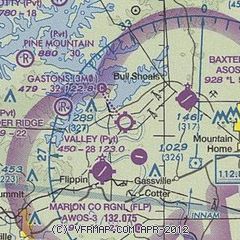 The flight review will equip you for most of the aspects of our trip: Cross Country Planning, Going VFR into Class B Airspace, Short and Soft Field Landings, Weather Planning. To register/request more information please fill out the contact form at the bottom of the page and include GASTONS in the subject line. We are pretty flexible and can accommodate pretty much anything you may need. Lunch on Saturday at KT's BBQ. Flight Review - A ground school will be held before the trip. *****All aircraft expenses will be separate and responsible by the pilots attending. Estimated costs will be roughly $500/pilot for aircraft rental. Aircraft that do not wish to land on a grass strip at Gastons can fly into Ozark Regional (KBPK) and park overnight for no additional cost. Transportation will be provided to these airports.